Join a brave team of aquatic action heroes deep below the ocean waves! 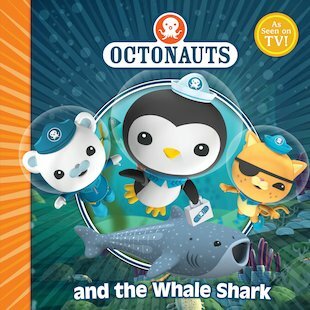 The Octonauts dive into action whenever trouble brews underneath the sea. From their mission headquarters, the Octopod, they deploy their fleet of awesome submarines: exploring incredible watery worlds, rescuing wonderful sea creatures, and saving the day time and time again! In this colourful adventure, the Octoalert sounds when Dashi is accidentally gulped up by a whale shark. It’s up to Captain Barnacles Bear, flanked by Kwazii Cat and Peso Penguin, to venture inside the huge fish and rescue her. Can they do it? Will they dare? Octonauts, to your stations! Colour Peso, Barnacles and Kwazii aboard the Gup-A! Match the creature to their shapes in The Octonauts and the Ghost Reef Rescue. Can you guide the intrepid crew out of the Olde Fangled Caves? Explore! Rescue! Protect! Hunt out the fishy words in the Octonauts wordsearch. Match the Octonauts characters with their shadows and names. Can you spot eight cakes or biscuits missing from the bottom picture? Can you spot the five differences between these two pictures of the intrepid Octonauts crew? Can you spot five differences between these two pictures of Kwazii Cat? Match each Octonaut to their activity on pages 6-7 of The Octonauts and the Only Lonely Monster. Read these tales to my son recently, they arent very favourite books but contain nice pictures.